This does not sound like the Steve Bannon that we’ve been watching over the last year and a half, or so. This new Steve Bannon brought to us by Vanity Fair doesn’t seem enamored with the President at all, in fact, quite the opposite, he seems to only see the President’s flaws. That has at least been a passing thought. In October, Bannon called an adviser and said he would consider running for president if Trump doesn’t run for re-election in 2020. Which Bannon has told people is a realistic possibility. In private conversations since leaving the White House, Bannon said Trump only has a 30 percent chance of serving out his term, whether he’s impeached or removed by the Cabinet invoking the 25th amendment. That prospect seemed to become more likely in early December when special counsel Robert Mueller secured a plea deal from former national security adviser Michael Flynn. 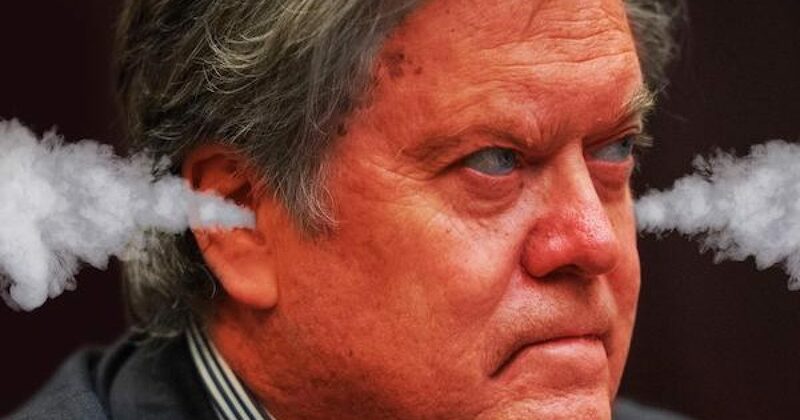 Bannon has also remarked on the toll the office has taken on Trump, telling advisers his former boss has “lost a step.” “He’s like an 11-year-old child,” Bannon joked to a friend in November. If that seems incredible to you, you’re not the only one. In case anyone’s curious: “Steve Bannon is 100% not running for president,” a source who works with him says. There is simply no way that Steve Bannon would ever run for national office himself, he simply does not have the tools to personally win an election race. However, the last statement may be the most remarkable comment from the entire piece. Does Bannon truly believe that the President seems to have “lost a step” over the last year? Is his mental capacity slipping? If this anecdote is true, it would play right into the hands of the leftwing anti-Trumpists who have been calling the President ‘unhinged’ for months now. Bannon must clear the record here. He has to either argue that he’s never made any such comment, or he has to explain that he did not mean to imply that the President was losing control of his cognitive abilities. Why? Because the Democrats (and their friends in the media) will use this to continue to press their attacks against the President and to imply that he’s mentally unfit for the job. In one sentence, Steve Bannon may have just provided his own enemies with the cannon fodder they needed to continue undermining our President.